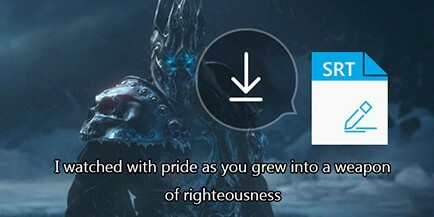 "I got .srt file when I recently downloaded a movie (.avi). I don't know what is SRT and how do I use it." "I downloaded a foreign film and the subtitles came in .srt files. But I don't know how to play SRT files. Does anyone know how to play them? I have DviX, VLC and WMP for vista. Is there a way to use one of these players to make SRT files play?" It's not hard to see that many users still don't have any ideas when come across SRT files. Actually, you have chance to find them every day on TV, computer, theatre, etc. Thus, to the meaning of SRT and how to add subtitles to movies or videos are pretty necessary. In fact, called as the most basic of all subtitle formats, SRT is the abbreviation of SubRip Text which contains formatted lines if plain text in groups separated by a blank line. Commonly, SubRip Text files are named with the extension .srt. The timecode format is used hours:minutes:seconds. Note: If your favorite movies/videos don't have subtitles, you can use a subtitles adding software to add SRT file to videos and movies for later playback. After knowing of what is SRT, we take a look at the four parts included by SRT files. 1. A number stands for which subtitle it is in the sequence. 2. The time that the subtitle should appear and disappear on the screen. 3. SRT Subtitle itself in one or more lines. 4. A blank line indicates that this subtitle is end. In addition to "what is SRT", users need to know what kind of video players support .srt subtitle playback directly. Here, I list some common SRT player for your consideration, like KMultimedia Player, Media Player Classic/Home Cinema, MPlayer, QuickTime, RealPlayer, 5KPlayer, VLC, Windows Media Player, etc. And inevitably, some advanced users have requirements on specializing SRT subs. 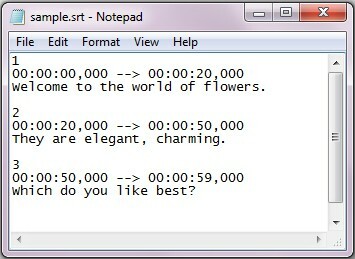 Don't worry about SRT editor, because Notepad, WordPad or other text editors are all available subtitle creation/editing tools. Nowadays, a subtitle becomes an indispensable part in video. Although most of people can know what actors said, in many cases, they still prefer to choose movies with intact SRT subtitles especially when watching foreign films. Sometimes, the existence of subtitles directly influences whether viewers can understand the plots or not in the process of watching. In the other hand, gradually, the issue of "what is SRT" will not be a puzzle to users so that more and more people want to add SRT subtitles to their self-made videos. But, the question is: how should we correctly add/hardcode SRT to MP4, MKV, AVI, HEVC? In some cases, your videos/movies may don't have any subs so that you need to download the .srt subtitles at first from internet. By the way, Moviesubtitles.org will be very helpful where you can find almost all movies' SRT subtitles. Of course, if you don't find proper SRT subs for you self-made video, you can try to create your own SRT file in Notepad, Wordpad, etc. Please note: the names of your created .srt file and the MP4 file should be matched; otherwise, you will fail to add SRT to mp4. For instance, if the movie file is saved as "Taken3.mp4", you must ensure the name of the subtitle file to be saved in "Taken3.srt". Here, MacX Video Converter Pro is highly recommended to you to add SRT to video. 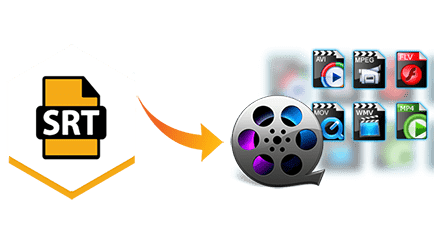 This SRT subs adding tool can help you to easily merge SRT subtitle with MP4, MKV, MOV, FLV, AVI, HEVC (H265), WMV and more files within a few clicks. Plus, this Mac video editor can also add watermarks to your video, shorten video length to shrink file size, crop video image, upscale 1080p to 4K, adjust frame rate, make iPhone ringtone, convert H265 to H264, etc. Note: This SRT subtitle adding tool also is capable of converting among any videos (MKV to MP4, YouTube to iPad Mini with Retina, AVI to iPhone 6, etc. ), downloading and converting YouTube videos, recording online videos, making photo slideshow video and editing video. So, you can not only enjoy your video file on the move, but also make you personal video for uploading to YouTube, Facebook, Blog, etc. How to add subtitles to a YouTube video: this tutorial gives you two different ways to easily add subtitles to YouTube Videos (MP4/MKV/3GP/AVI) for sharing with others from all over the world. How to add subtitles with iMovie 11/10/9/8 easy as possible? Stay on this page and you will know the solution to add subtitles to videos movies in iMovie just a click away. The solution to fix VLC subtitle delay issue can be found here. Just follow the tips to easily synchronize subtitles with movie/video in VLC media player. MacX Video Converter Pro is a functional video editor which can allow you to freely add external subtitles to videos/movies. It also can download and convert 8K/4K/1080P/720P videos from YouTube and other 300+ sites.